After a little bit of a break I am excited to be back to posting my creations on the Die Cut Diva Blog! I made this fun little Creel Box for this weeks CHF challenge and wanted to be sure and share it with all of our Die Cut Diva Fans too! Here's my Creel Box all decorated for my fisherman! I started with a Creel Box die cut from Creative Cuts and more. I stamped the Netting Backgrounder by CHF on the Creel Box with VersaMark ink and then put the box together using Killer White Tearable Tacky Tape. The image and the sentiment are Digi stamps from Cornish Heritage Farms. 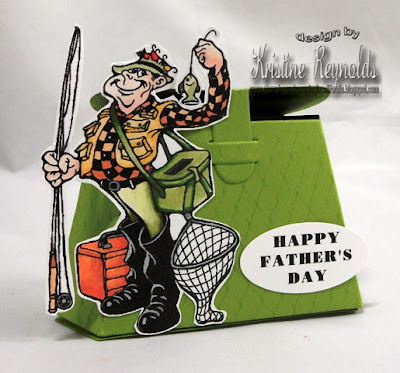 This Creel Box die cut fits a gift card and would be a very fun way to give one to your favorite fisherman! Some new ladies are joining the Die Cut Diva design team so we should be back to more regular postings in June. I hope you'll be back soon for some more inspiration!